I read very few comics growing up. My brother and I had a few Star Wars comics, but that was about it. 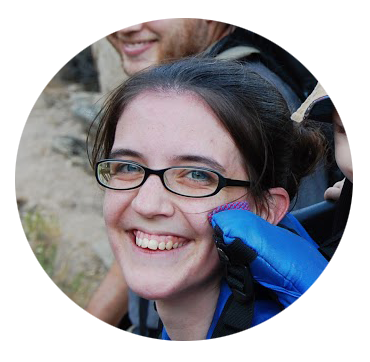 Then Tim introduced me to the world of comics and webcomics when we were dating. Many times we would go out to visit Barnes and Noble and just sit and read. We also frequently would sit and read webcomics together. My favorite (that I need to catch up on – I’m several years behind!) is Girl Genius. We even started our own webcomic several years ago. The art was pretty awful, and I’m happy to say I’ve improved a bit since then. But it was a very fun experience. And someday we hope to revive that project. 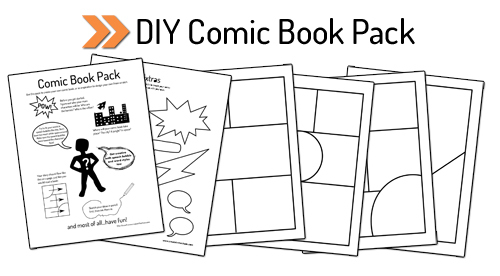 Today I have a small printable pack for any kiddos that are aspiring comic book artists, plus some of my favorite how to draw resources. They can use it to create their own comic book or get inspired to design their own. 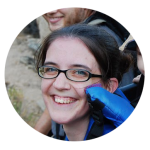 I’ve included comic templates, speech bubbles and doodads to cut out, and some fun tips for creating your own comic. 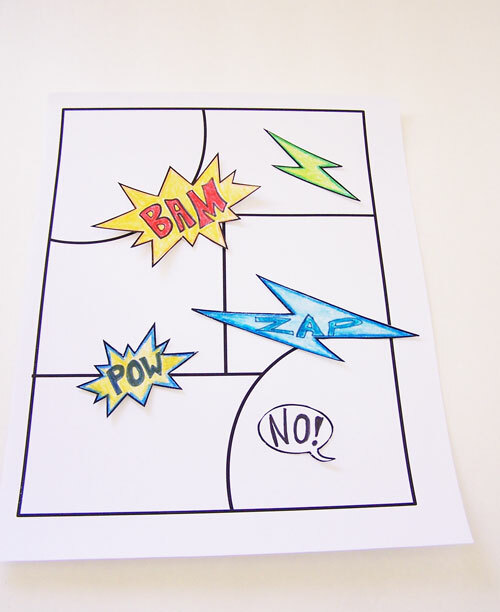 Feel free to print off multiple copies for your child to create longer comic books, or let them use what’s in this pack to inspire them to completely design their comic book from scratch. My boys are a little too young to fully enjoy this project, but I think it will be something my oldest will enjoy someday soon. Print off the pack here. How To Draw Comics The Marvel Way – This is the “go-to” book for aspiring comic book artists. I don’t own it, but have checked it out from the library multiple times. Action! Cartooning – This book is simple to follow, gives lots of great tips along the way, and can inspire a lot of ideas. Fantasy! Cartooning – If you enjoy Action! Cartooning but are looking for more help with fantasy illustrations, I highly recommend this book. Modern Cartooning -I only recently got this book, and it’s phenomenal. I wish I had it a couple years ago when I first started learning how to draw. It starts with the very basics. Mark Crilley’s YouTube Channel – Sometimes it can be tough to find appropriate “how to draw” videos on YouTube for kids to watch. While I haven’t watched every one of his videos, I’ve watched the majority of them. Not only are they well done and entertaining, but they are very clean. 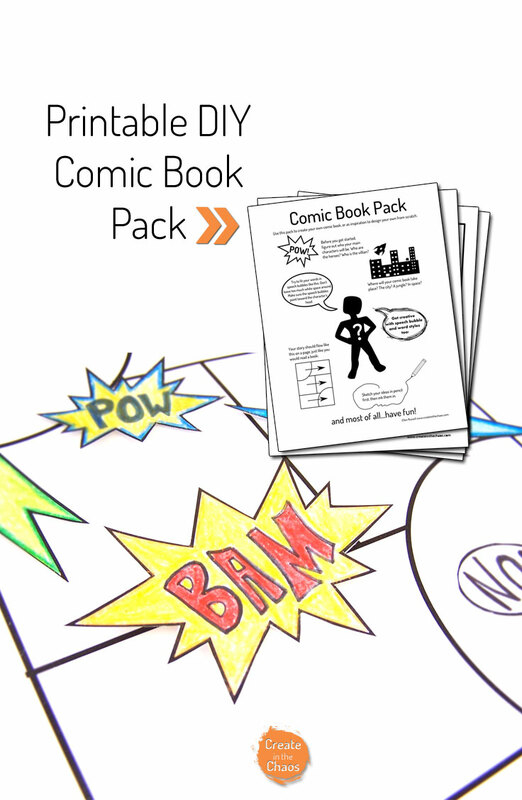 I hope your kiddo enjoys creating their own comic books with this pack! P.S. Looking for more fun printables? 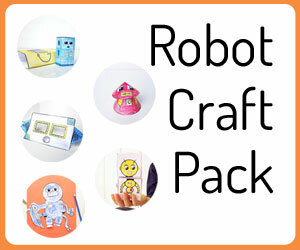 Check out my Printable Papercraft Pack. You have a nephew who will LOVE this! I thought he might 😉 And seriously check out the You Tube channel I linked – it’s amazing and so clean. I want to start doing some of his videos with Malcolm. This is Awesome! Would it be okay if I used it for our family literacy night?